Playing as part of new band night brand Control Social Club (concocted to hopefully inject a little energy into the stagnating Edinburgh alternative rock scene), is the Glasgow three-piece Polarnecks, a group of lads with the desire to make some noise and the ability to pull it off. CSC promoter Adam invited FEAST along to review the bands featured in his new gig night – and thank God he did, because that was one hell of a night! I was impressed by their back catalogue, available on their BandCamp page; forward thinking grungy-ness with a melodic bent and a scuzzy guitar tone refreshing from the clean-crisp sound of their indie counterparts, as well as some hauntingly angular acoustic tracks. I’m genuinely surprised by the revelation that all these recordings were homemade yet sounding as professional as any of their peers, if not more so. They cite the 80’s alt rock scenes of DC and Seattle as the main influence on their sound; Lukas has a particular fondness for The Cribs; but their good humour and general optimism shine through the heaviness to make an entirely new beast. I met up with the guys in the early evening after their soundcheck for a quick chat, just to get a flavour of the faces behind the music. 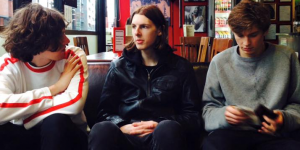 Polarnecks – consisting of Lukas (Guitar & Vocals), Callum (Bass) and Innes (Drums) – formed as school friends under a slightly different line-up and have been playing for around two years, with bassist Callum recently joining the gang. Far from pulling teeth, the guys were as pleasant and talkative as I’d imagined they would be – singer Lukas seemed a bit more withdrawn, though understandably so; the double threat of fronting a band in an unfamiliar setting would be a daunting task for anyone. 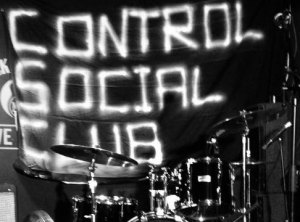 It’s also how I know they really mean it when they excitedly talk to me about the opportunity the new Control Social Club night presents to spark a new wave of interest in rock, both in the city and the around the country in general. “I’m not sure what it’s like through here in Edinburgh,” drummer Innes explains to me, “but there’s far too many promoters doing the pay-to-play thing, taking advantage of young bands just wanting to get a gig.” He sings the praise of Adam, the man behind Control Social Club, claiming we need people to take a more focused and curated approach to putting on concerts featuring likeminded bands with a shared appeal. I agree! The lads came off stage sweating but chuffed; they well and truly hyped the place up for the bands proceeding them, Sweaty Palms and headliners the Rockalls. The crowd and bands got unruly alike; crowd surfing, mosh pits, stage invasions, gear strewn about the place and one smashed bottle of Buckfast (Glasgow bands, aye!) It was a spectacle alright, but it all distracted from the music of the last two bands who, in my opinion, were just not as consistent as Polarnecks. We saw two bands in their prime causing mayhem, and we saw one burgeoning band with a far punchier sound telling of unknown potential. For Lukas and company the only way is up, so catch them at this level while you still can!